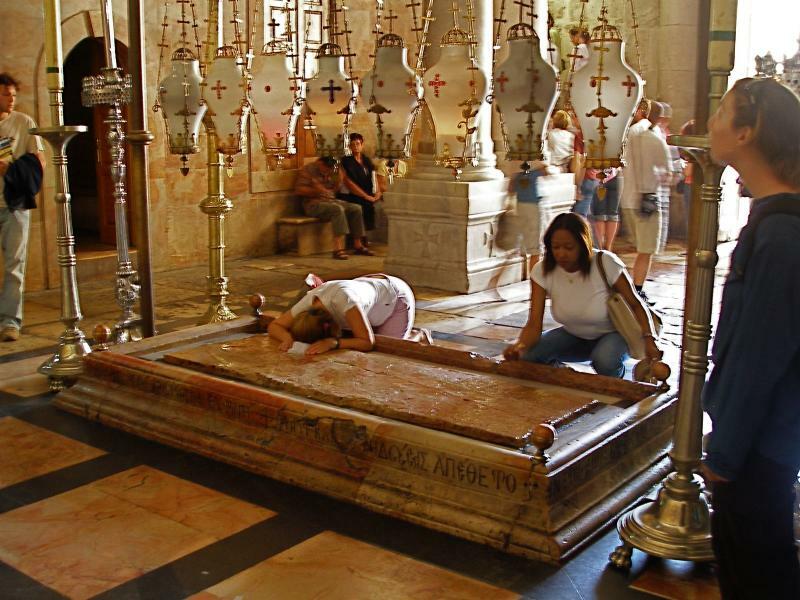 Getting permission to stay overnight in the Church of the Holy Sepulchre — the ancient edifice in Jerusalem that enshrines the place where Jesus died and rose again — is easier than I expect. The Franciscan sacristan consults a slip of paper with numbers on it, checking he’s within his quota of 15. “No sleeping,” he warns. Sleep? At the most sacred place on earth? 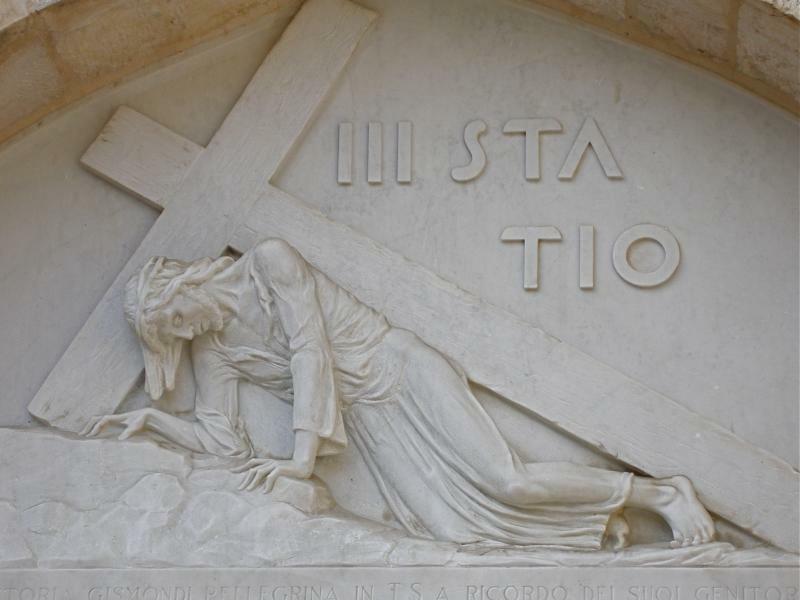 Then I remember the disciples who could not stay awake one hour with Jesus during his agony — their drowsiness recalled by sleeping figures under the altar in the Grotto of Gethsemane. My wife Suzie and I had led our fifth pilgrimage to the Holy Land. 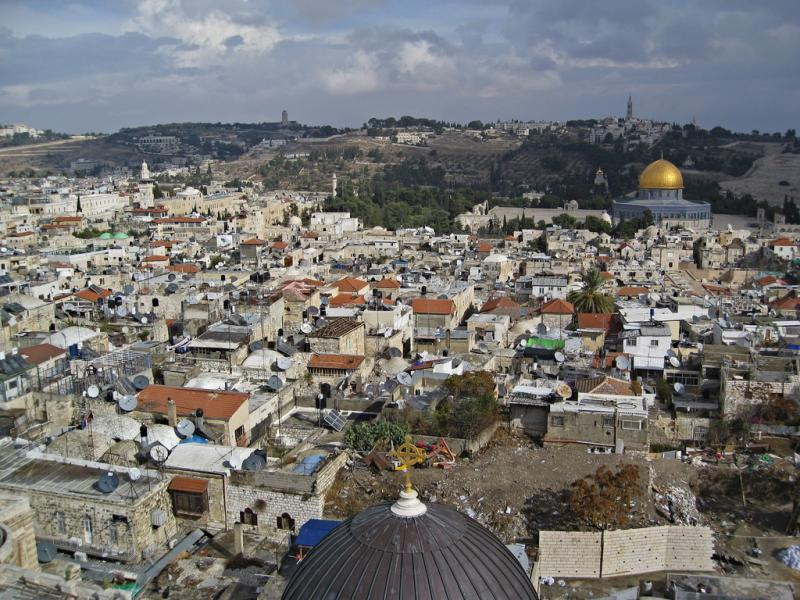 Our pilgrims had gone home and we were spending time by ourselves in the Old City of Jerusalem. The dun-coloured Romanesque basilica stands gloomily against the darkening sky when we arrive, well ahead of the 7pm closing time we have been given. We wait on one side to watch the door-locking ceremony. 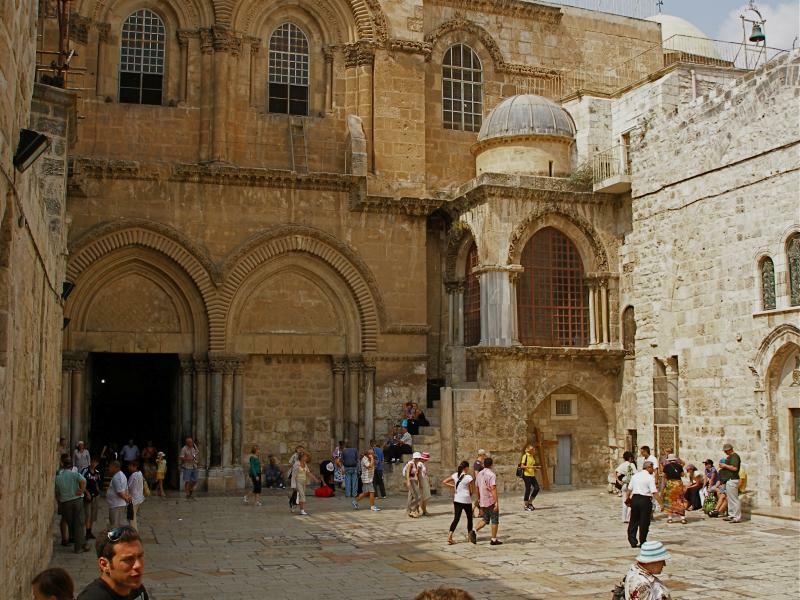 Two gun-toting Israeli policemen see the last visitors off the premises and an Orthodox clergyman pushes the massive door shut. Representatives of the other denominations, one a brown-habited Franciscan with a crewcut, see that protocol is observed. 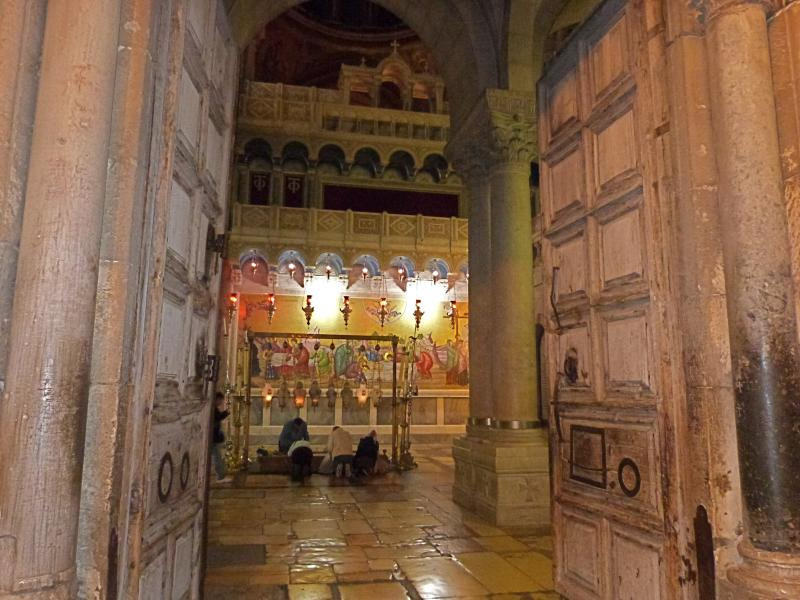 An Orthodox clergyman closes the door of the Church of the Holy Sepulchre (Seetheholyland.net). 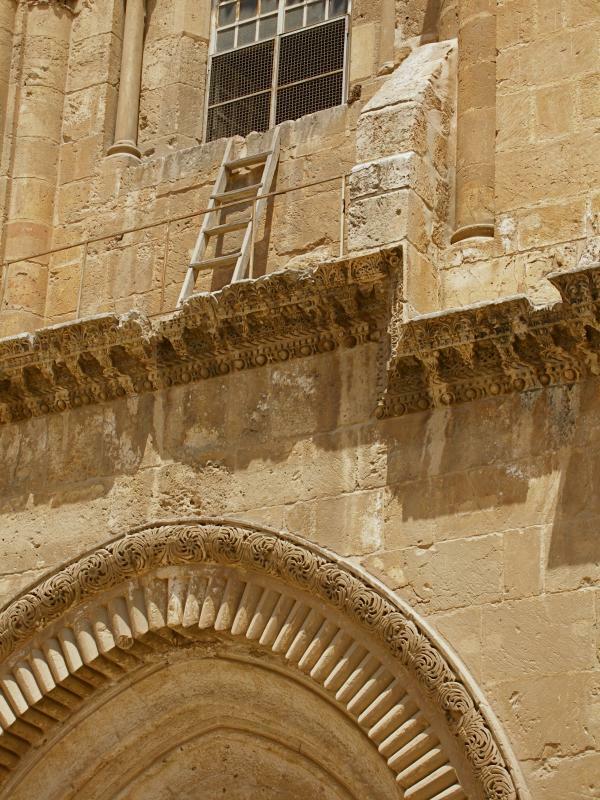 Outside, a man in a striped T-shirt — from one of the two Muslim families who for more than 750 years have been charged with holding the key and opening or closing the church — climbs a ladder and locks the door. He then passes the ladder through a square hatch in the door, so it can remain inside until opening time. The clergy depart and our small group of all-nighters — 15 altogether, including four nuns, from Mexico, the United States, New Zealand — is alone in lamp-lit shadows beneath the sombre darkness of the great dome. I’ve spent many hours in this church over the years, marvelling that mind-boggling events of salvation history happened right here. 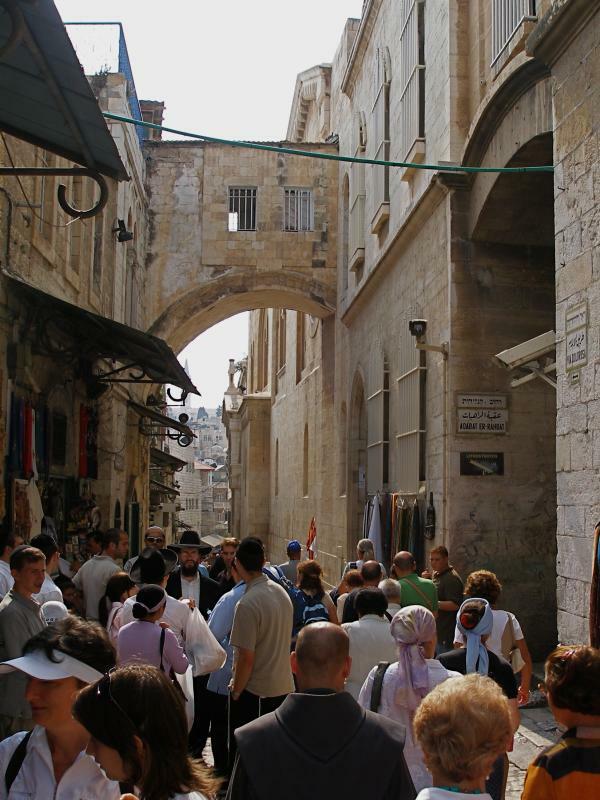 Always it has been abuzz with visitors — cameras flashing, cellphones ringing, the chatter of conversation, tourists getting their photos taken in front of Christ’s Tomb . . . . 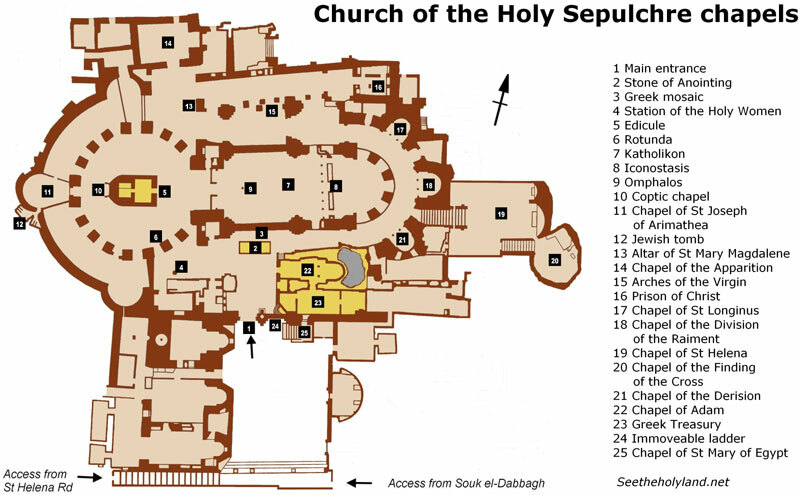 The edicule containing the Tomb of Christ, with doors closed while sacristans work inside (Seetheholyland.net). Tonight it is quiet. This unlikely fact is worth restating: It is quiet. Quiet to climb the timeworn steps to the mezzanine floor of Calvary. 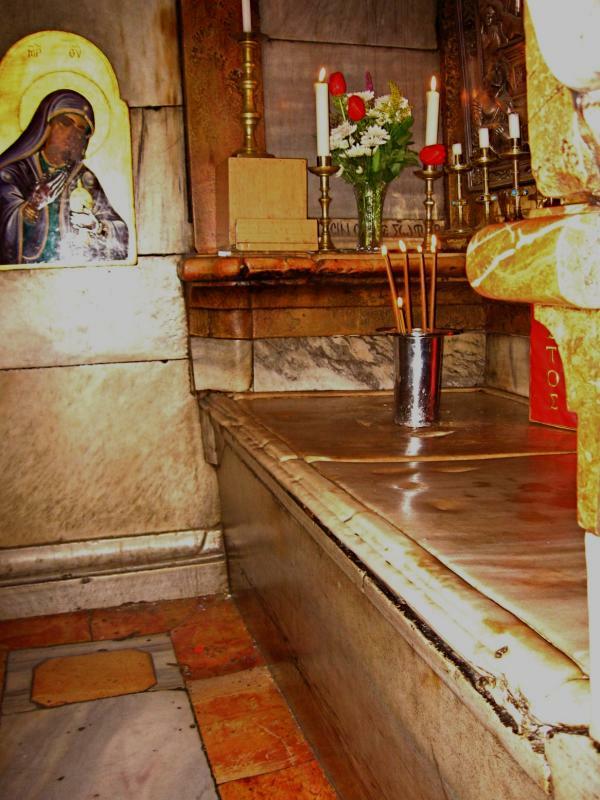 Quiet to visit the Tomb where Christ lay — the site of the Resurrection. Quiet to descend 29 steps to the underground Chapel of St Helena and, further down, the rock-cut cistern that is now the Chapel of the Finding of the True Cross. 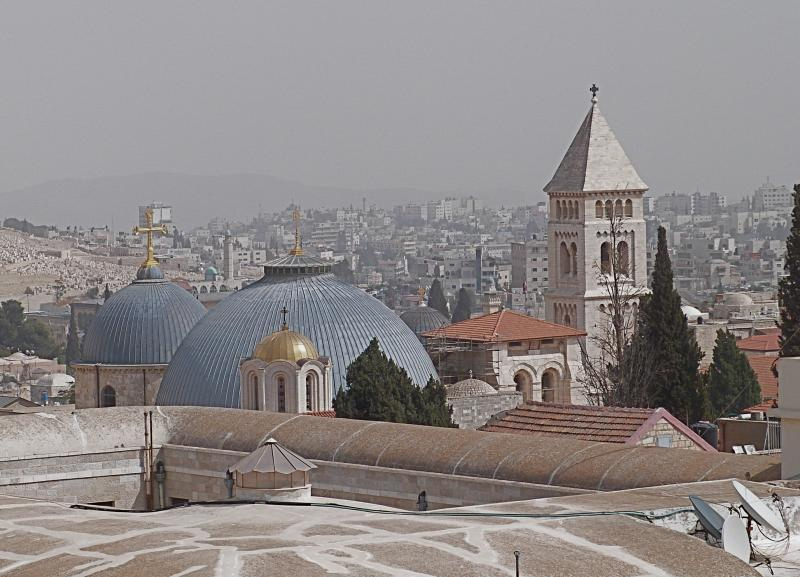 A reverential silence permeates this vast building with its sprawling jumble of 20-plus chapels and worship spaces. 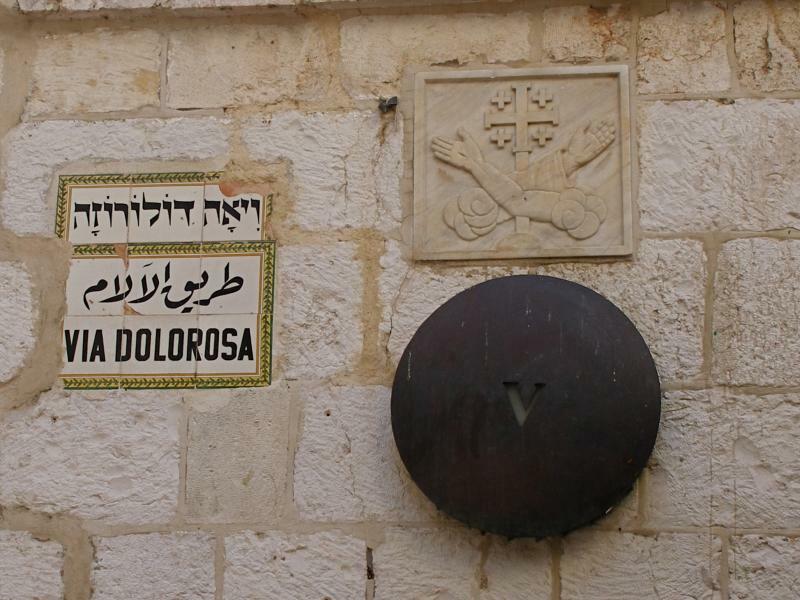 At the edicule (“little house”) built over the Tomb, its unstable walls held together by iron girders installed in 1934 during the British mandate, Orthodox sacristans move in to trim the flickering oil lamps and pick up rubbish left by visitors. 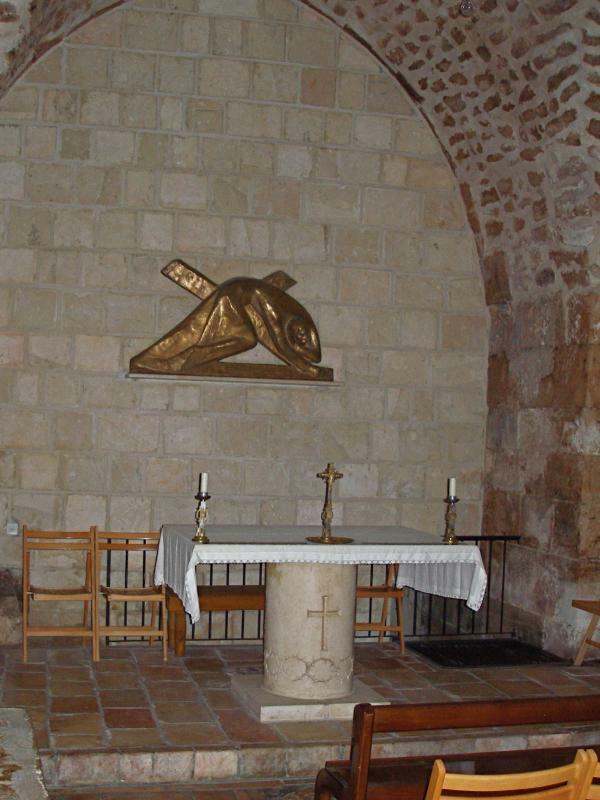 Inside the Chapel of the Angel, with a low doorway leading to the Tomb. 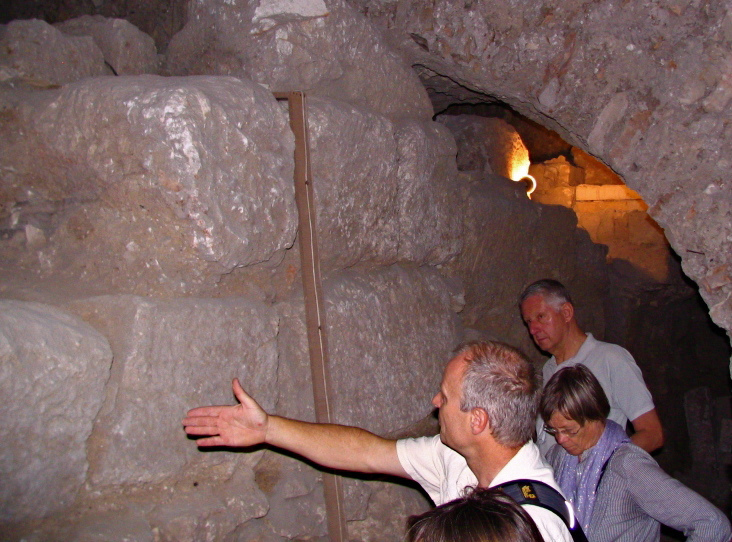 The pedestal at right contains what is believed to be part of the rolling stone that closed the Tomb (Seetheholyland.net). 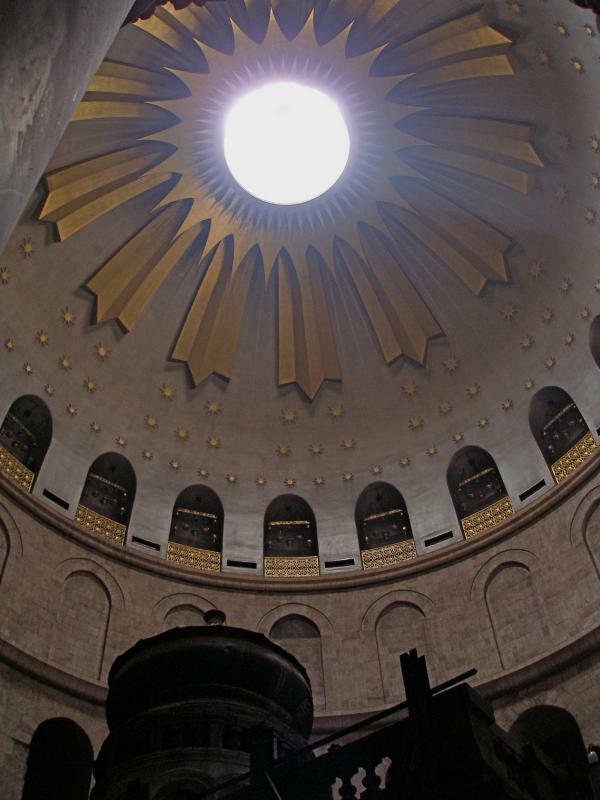 When their work is done, we can visit the Tomb in our own time. 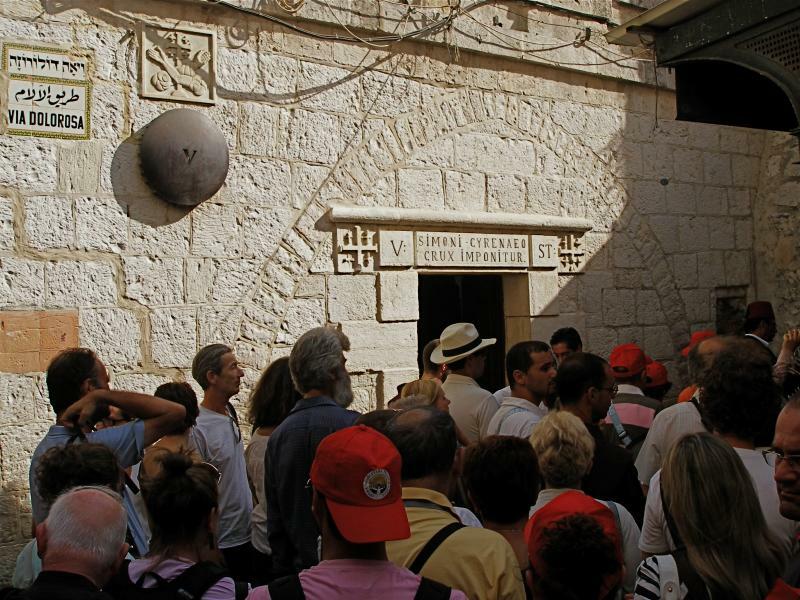 Past memories of being herded in and hurried out by a Greek Orthodox priest controlling a motley queue of visitors behind police barriers are best forgotten. 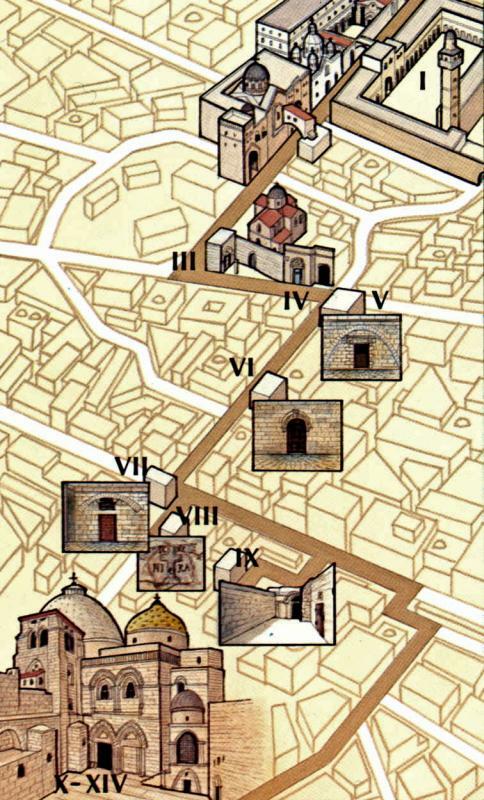 The edicule has two chambers. 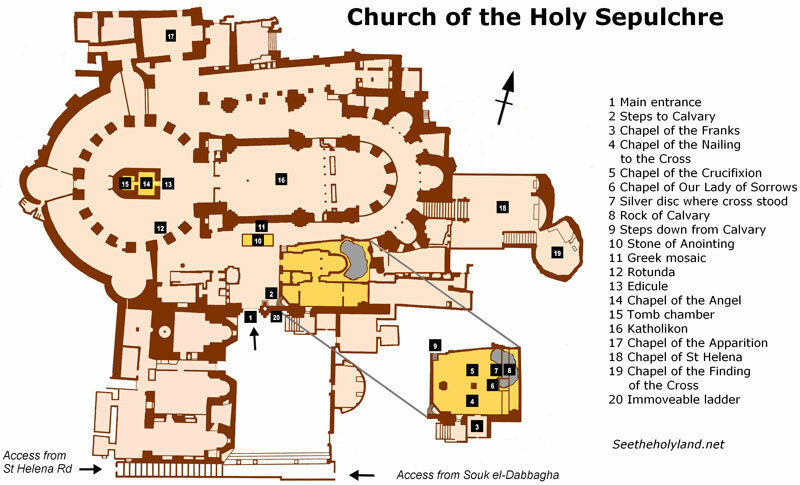 The first, the Chapel of the Angel, is an antechamber leading to the Tomb. 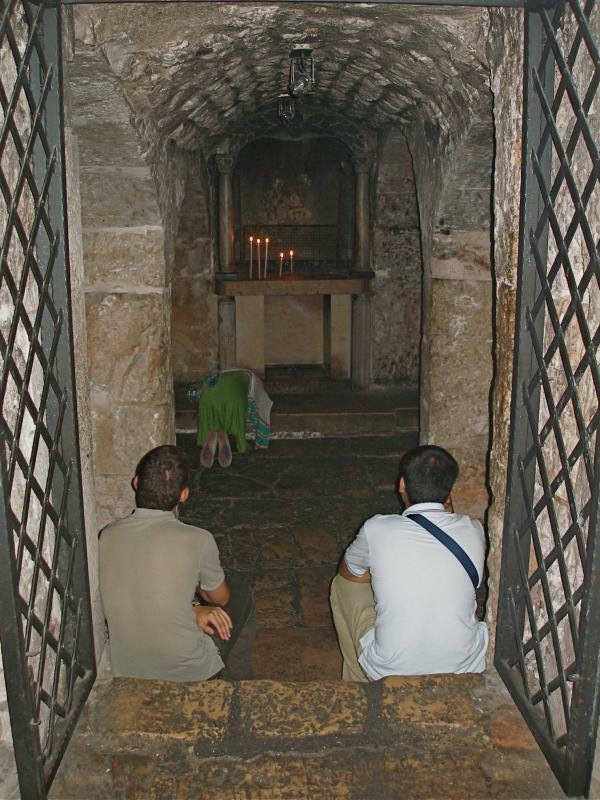 In the Tomb chamber, a marble slab on the right covers the rock bench on which the body of Jesus lay. 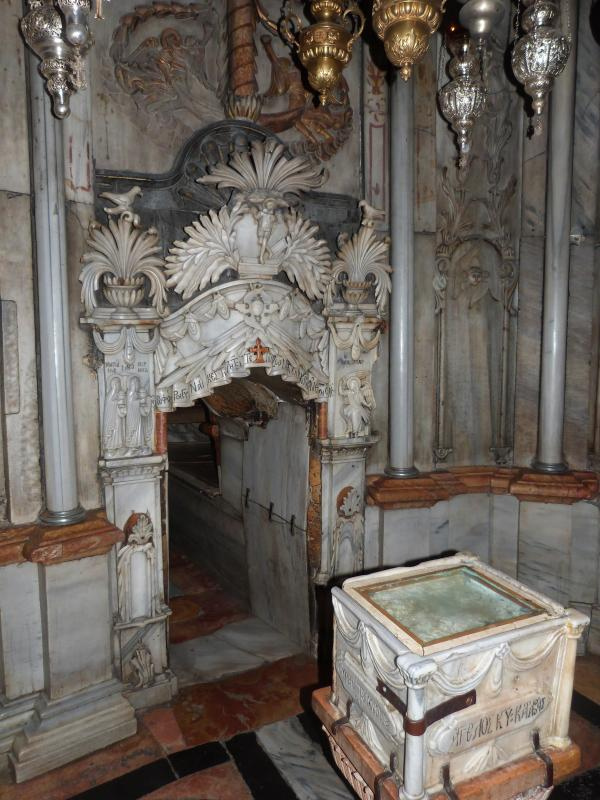 The slab was deliberately split in 1555 to deter the Ottoman Turks from looting such a fine piece of marble. 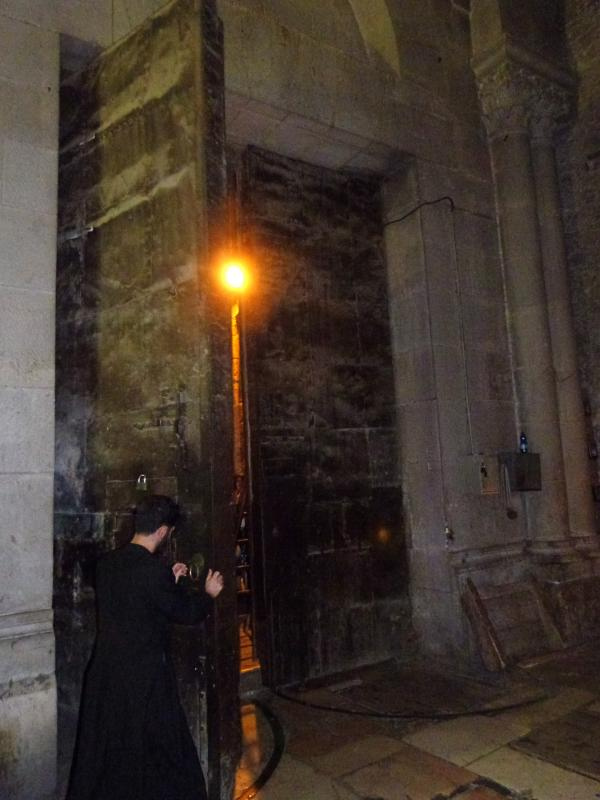 Leaving the Tomb, I forget how low the doorway is and bang my head on the carved stone arch. 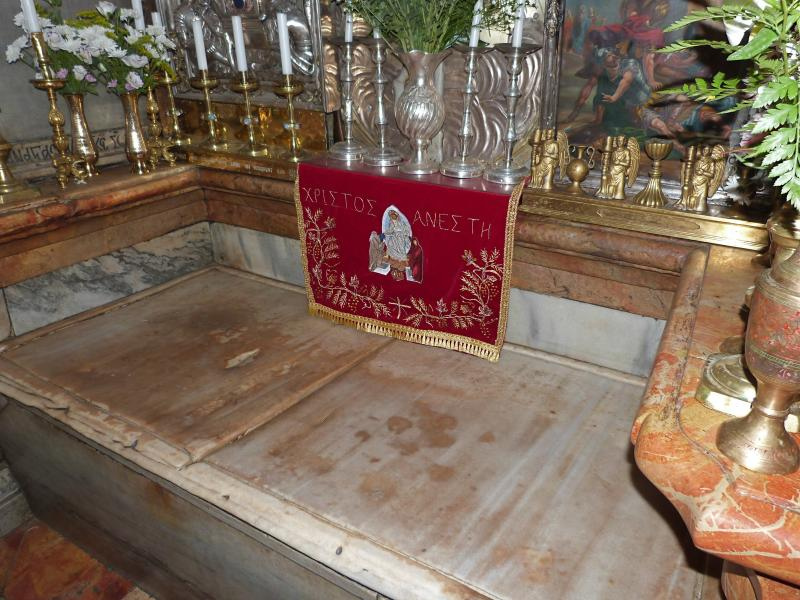 The marble slab covering the rock bench on which Christ’s body lay. 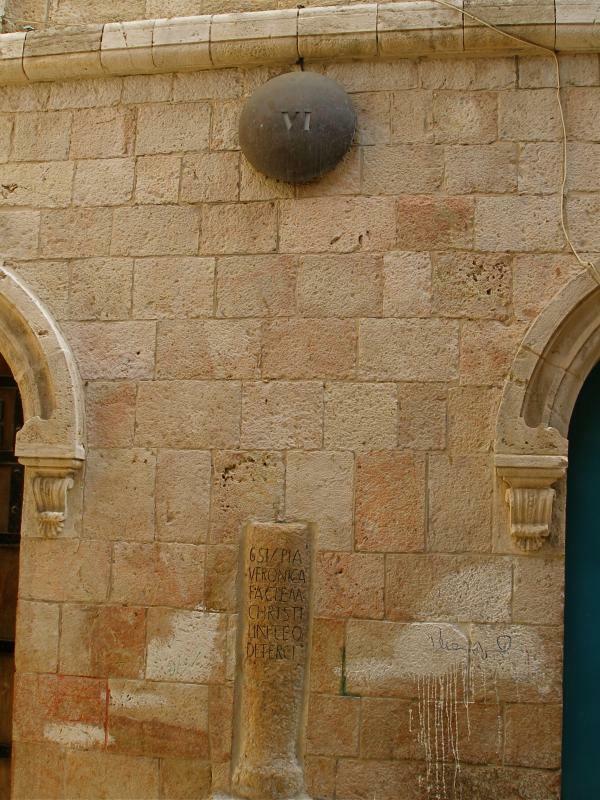 The slab was deliberately split in 1555 to deter Turks from looting it (Seetheholyland.net). Sitting on a bench in front of the Tomb, one of our all-nighters makes notes on her iPad. 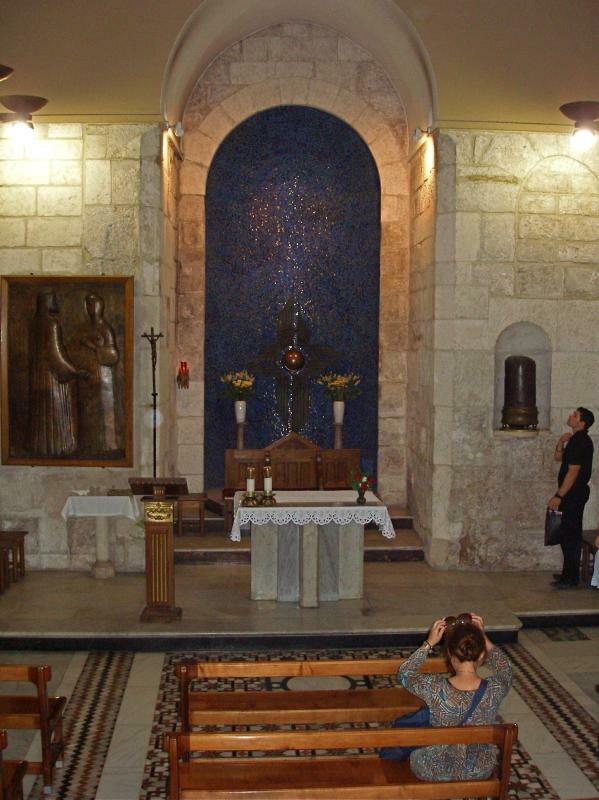 At the altar of Mary Magdalene, two nuns sit and pray, their backpacks beside them. In the distance a church bell rings. Somewhere in the church a dove coos. In the living quarters, a key turns and a door opens. 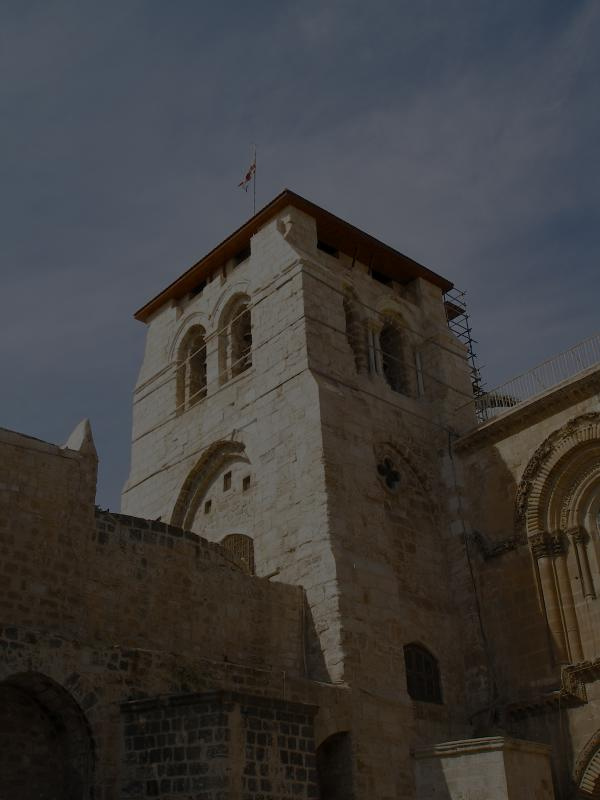 Feet hasten on stone steps, evoking an image of Mary Magdalene and the apostles running to the Tomb. Shortly after 10.30pm a cool breeze sweeps through the church. The door has been opened and scores of Orthodox faithful, the women wearing head scarves, stream in for their Divine Liturgy. 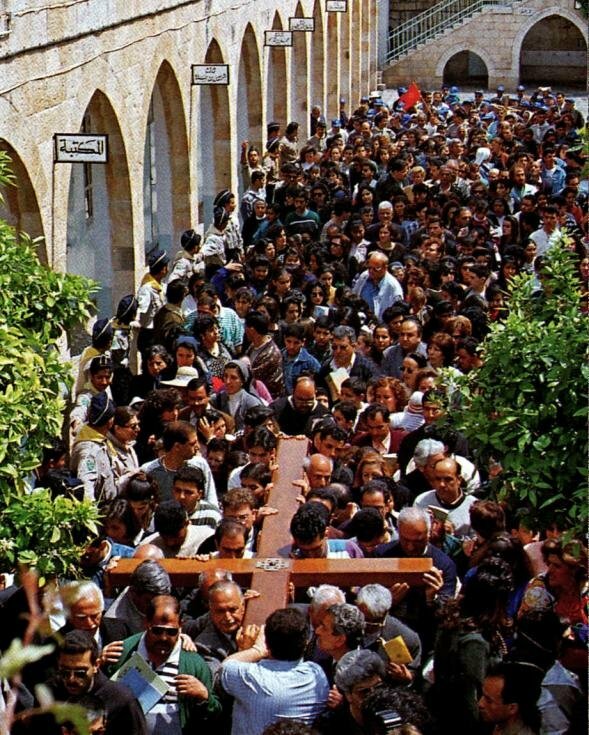 Orthodox faithful, arriving for their Divine Liturgy, venerate the Stone of Anointing that commemorates the preparation of Christ’s body for burial (Seetheholyland.net). 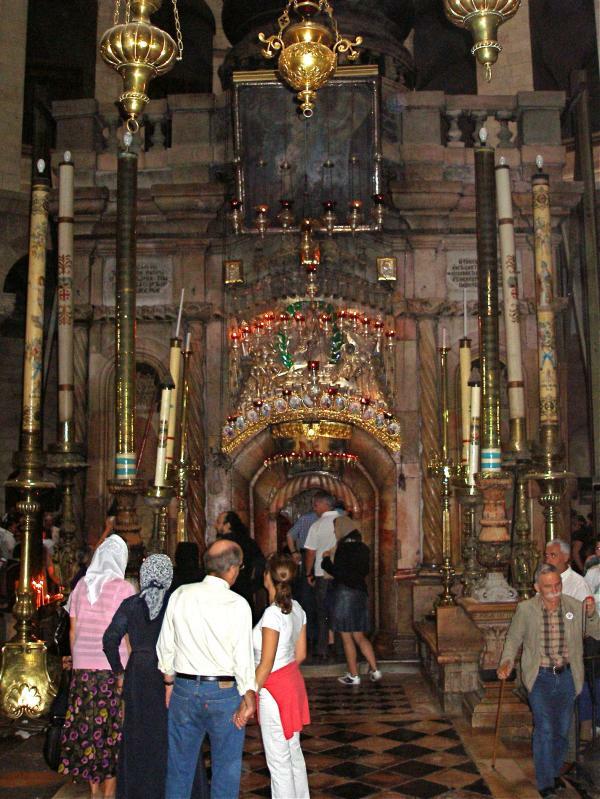 They crowd the Stone of Anointing and queue to enter the Tomb. 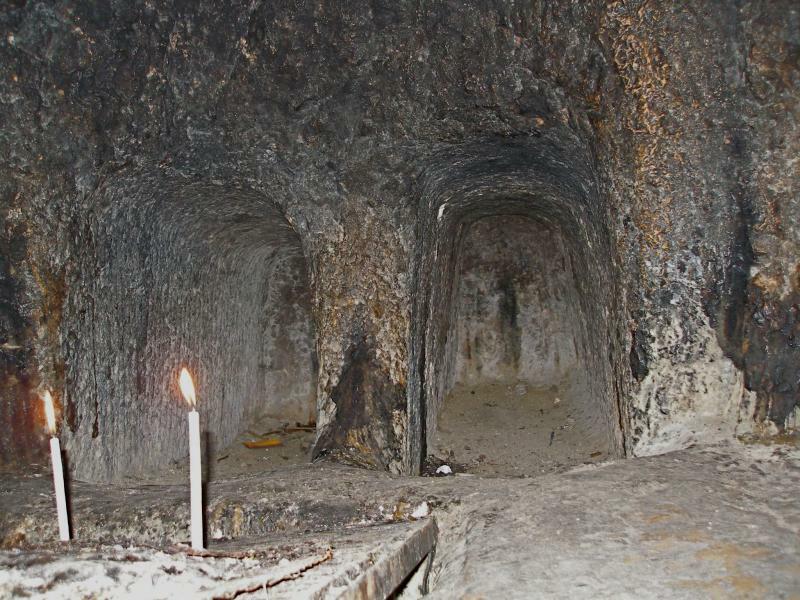 Some light bunches of tapers from candles outside the Tomb, then hold them under a snuffer to extinguish them to take home. An air of business prevails as Orthodox clergy and sacristans bustle around to prepare for the vigil service. 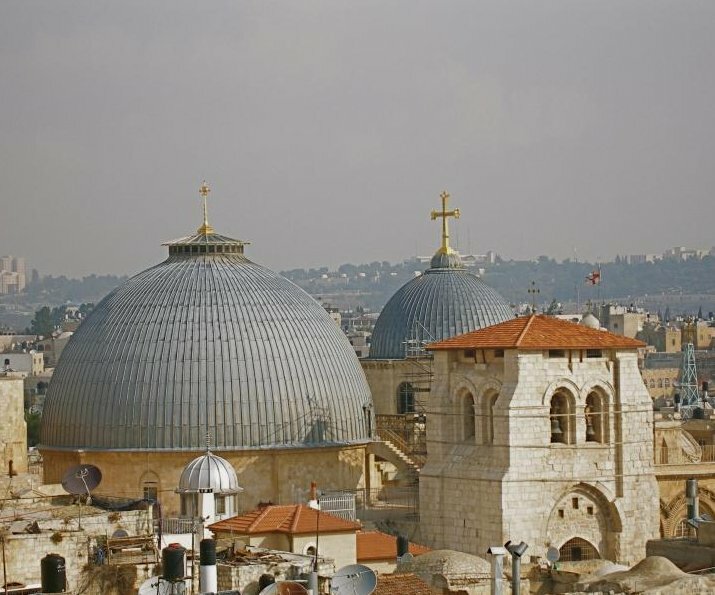 It reminds us that the Church of the Holy Sepulchre — which the Orthodox more appropriately call the Church of the Anastasis (Resurrection) — has been predominantly an Orthodox place of worship since 1757. 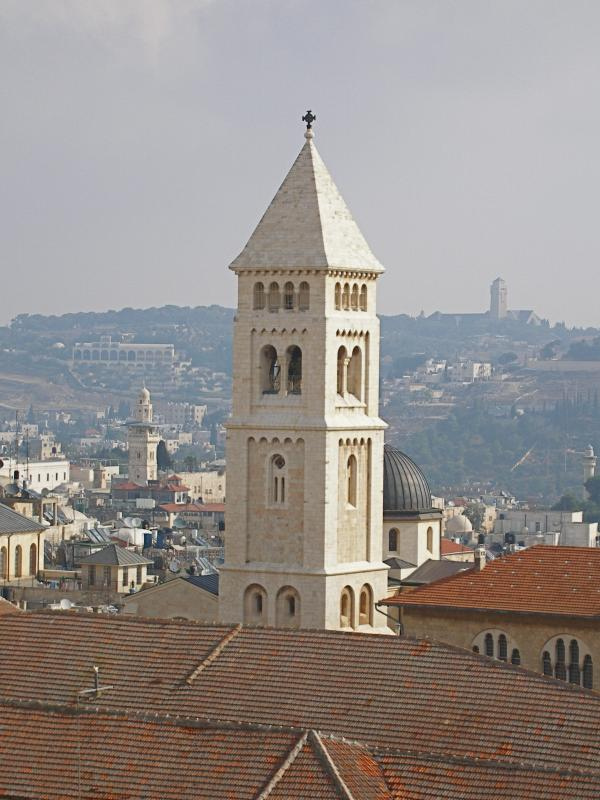 Six churches share the building: Greek, Armenian, Syriac, Coptic and Ethiopian Orthodox, and Catholics. 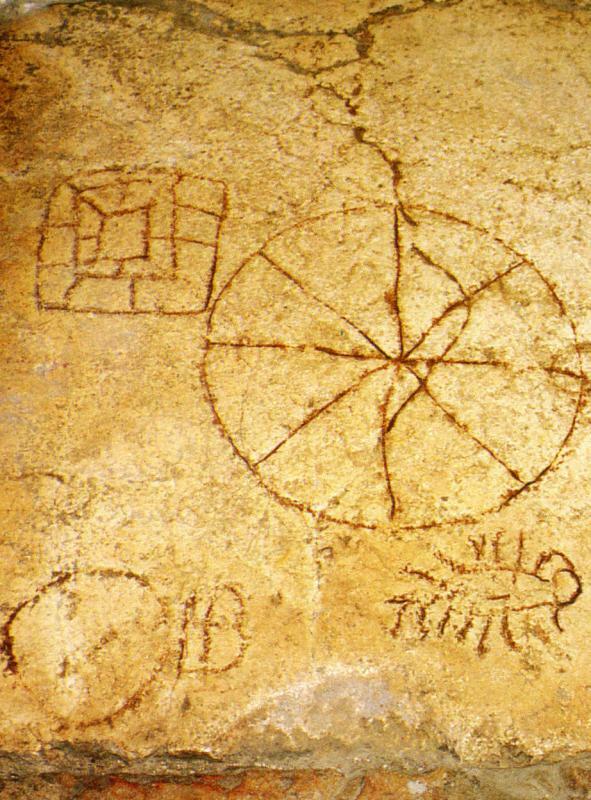 The Greeks rate first in the pecking order, followed by the Catholics (known as Latins in the Holy Land). 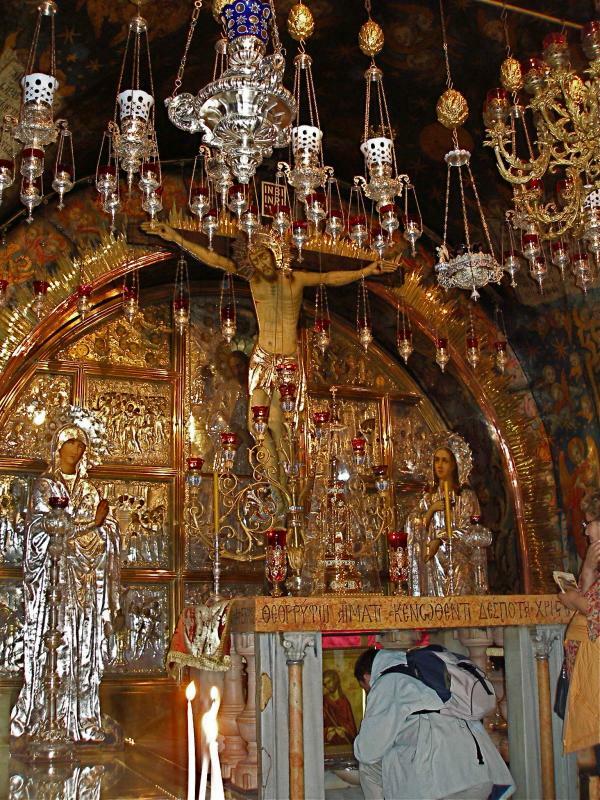 A Greek priest emerges from the Katholikon — the main worship space, which is the Greek Orthodox cathedral — and physically uncrosses the legs of an unsuspecting all-nighter. 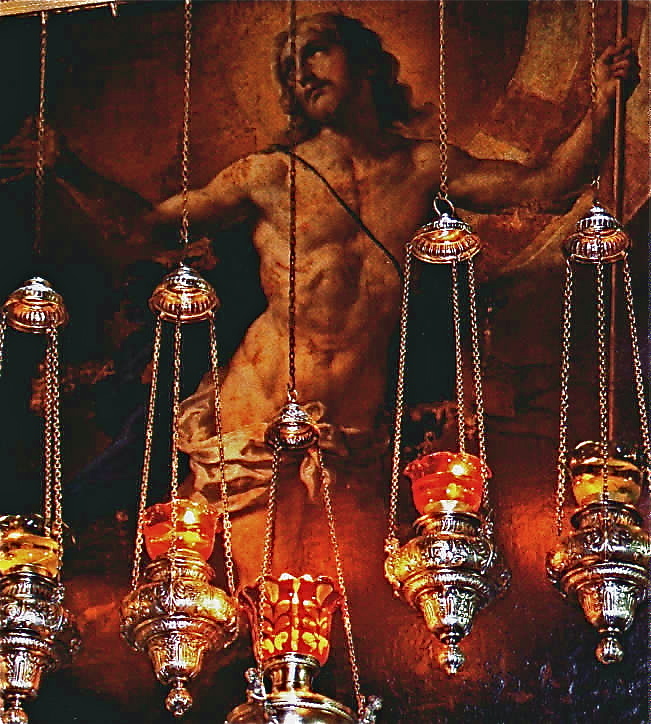 Crossing the legs is a no-no to the Orthodox, who believe we should always sit attentively in church. 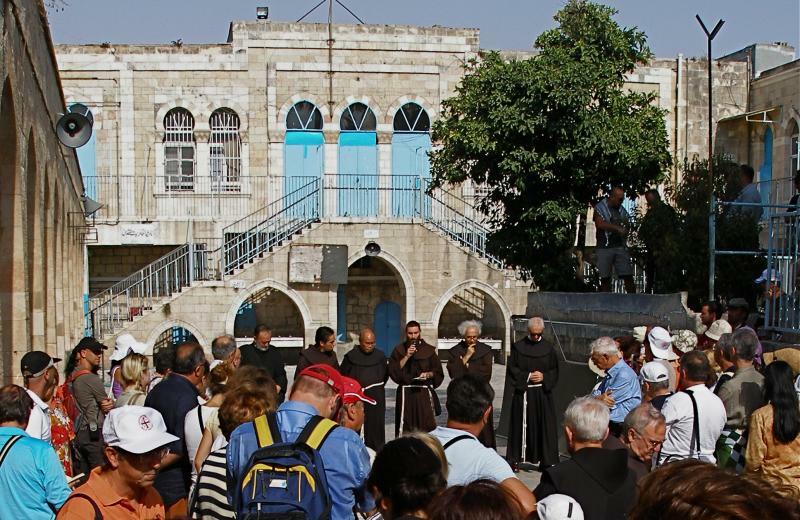 Orthodox clergy undertake an energetic round of incensing before their Divine Liturgy (Seetheholyland.net). 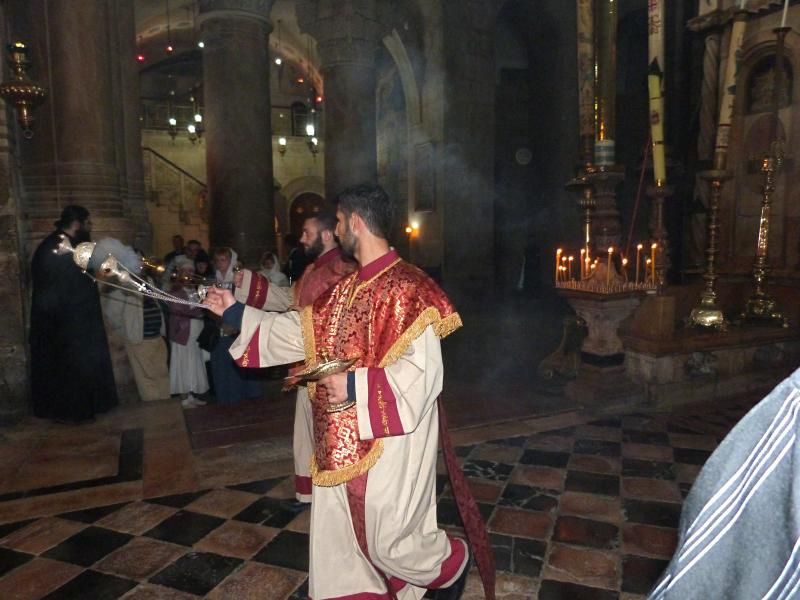 An energetic round of incensing, including the Catholic chapels, precedes the Orthodox liturgy. 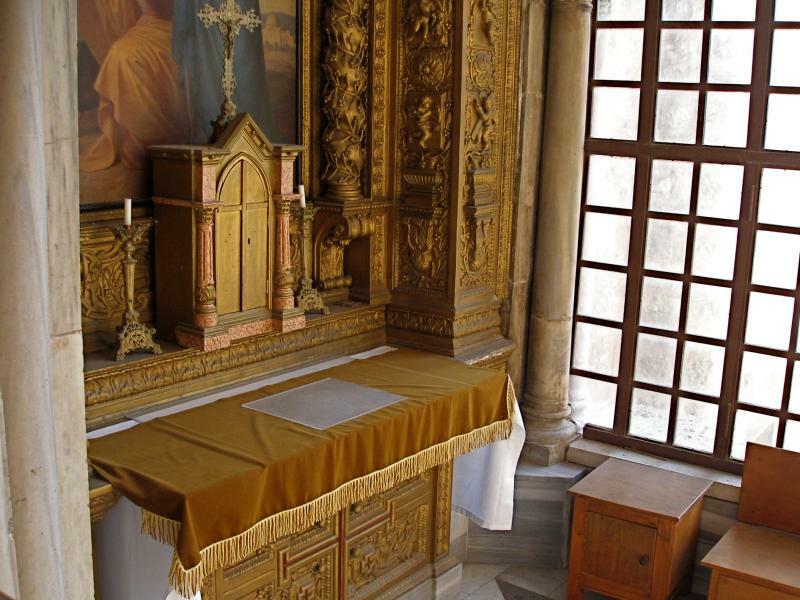 The service itself — in front of the edicule, with the congregation standing — is a splendid ritual of ornate vestments, bells, chants, incense and processions. The only words we recognise are “Kyrie Eleison”. 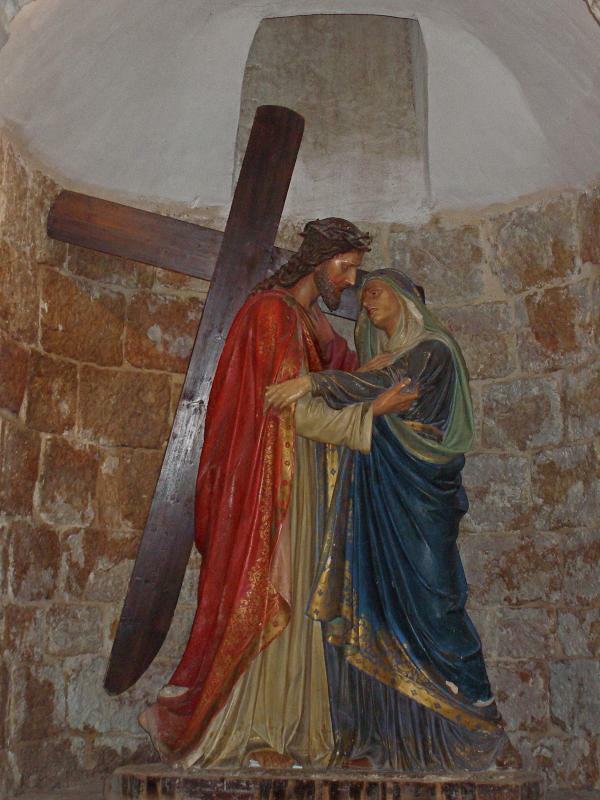 This plea for the Lord’s mercy is repeated time and again. As we move closer to observe, a Greek priest confronts us. “You Orthodox?” he demands. We shake our heads. 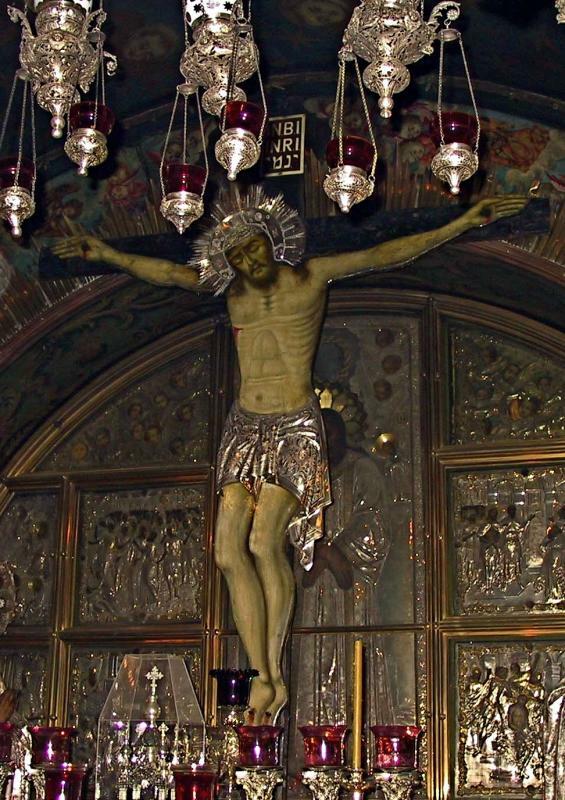 “Go, go.” Vigorous arm movements support his words of muscular, rather than ecumenical, Christianity. 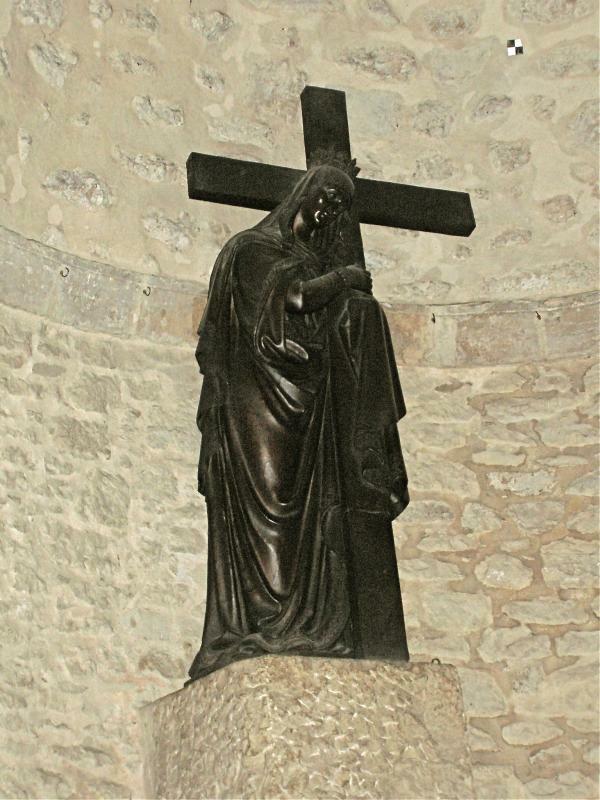 We retreat to the calm of the Catholic Chapel of the Apparition, which commemorates the tradition that the resurrected Christ appeared first to his Mother. 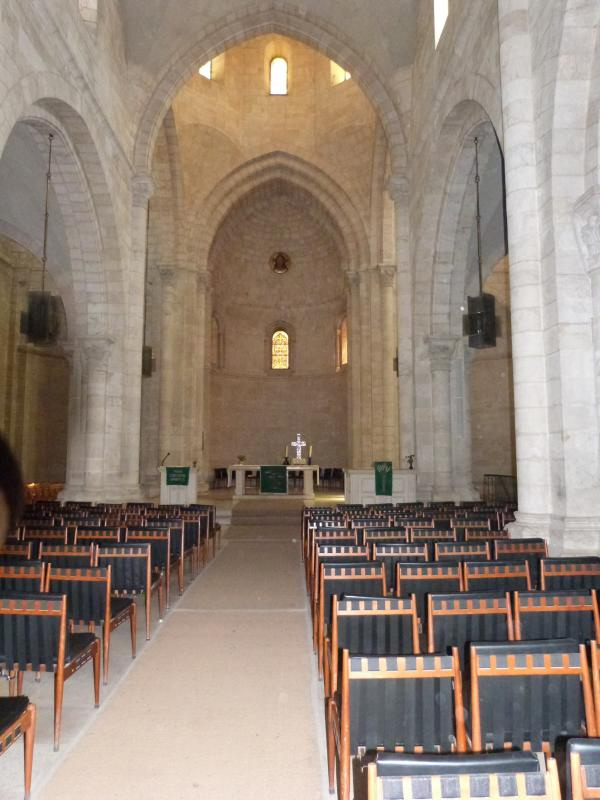 In the choir behind us, Franciscan friars begin to chant their Office. 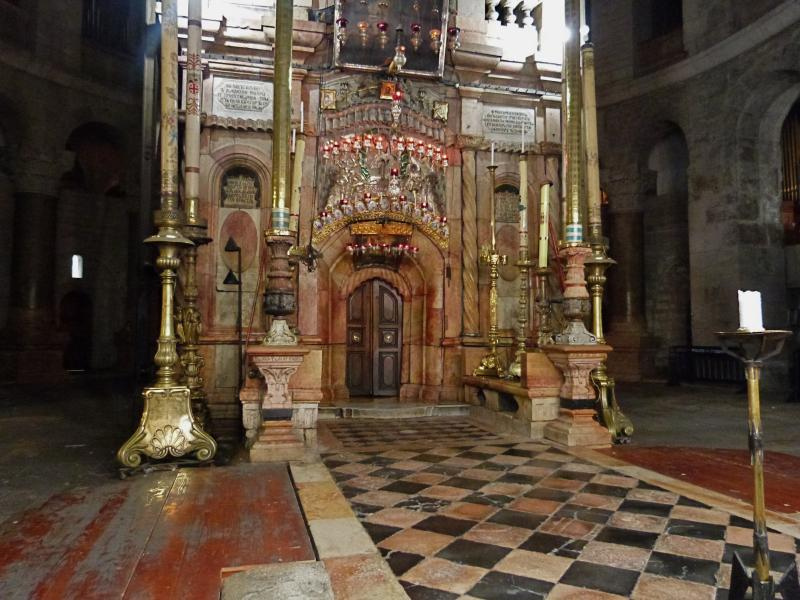 Around 3am a series of resounding responses from the Orthodox congregation heralds the end of the service — four and a quarter hours after it began. 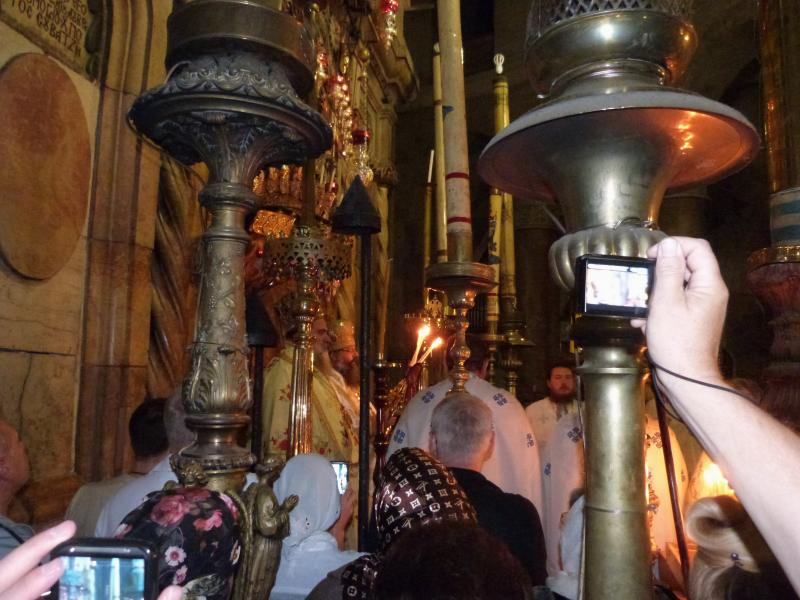 Behind tall candlesticks, Orthodox clergy celebrate their Divine Liturgy (Seetheholyland.net). Gradually the stillness returns. Lamps gently flicker. Noises echo in cavernous spaces. There’s time to meditate and pray. 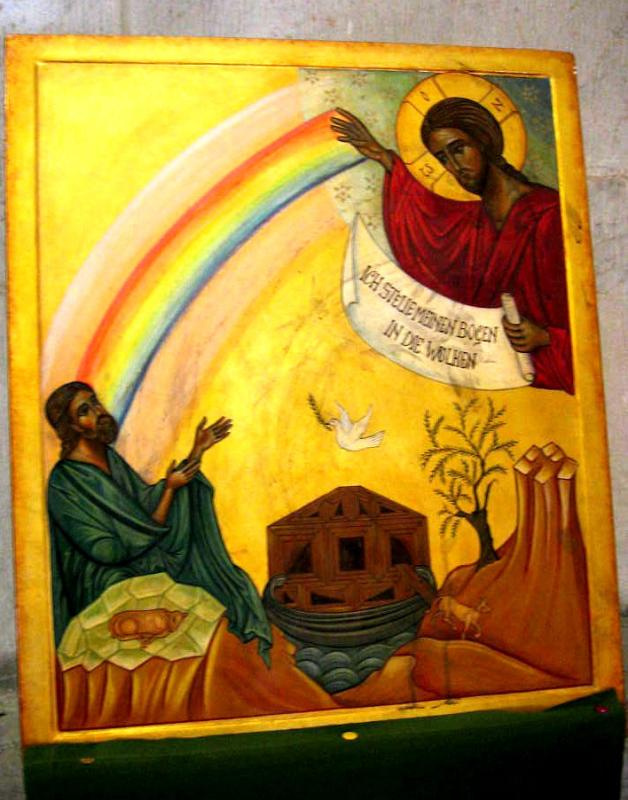 To bring the Risen Lord into the past, present and future of ourselves and our loved ones. To remember those who have died and gone before us. 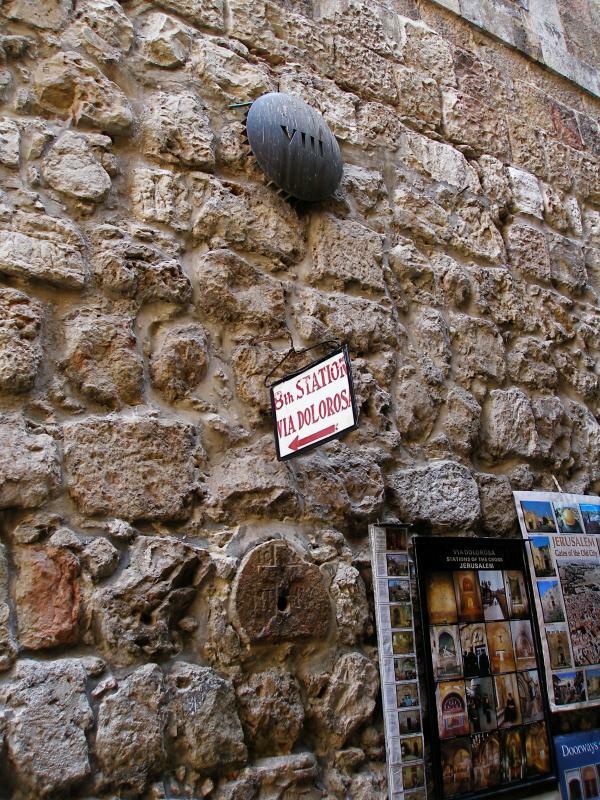 To remember those who had asked us to pray for them in the holy places. Time to reflect on the artworks and to think of the thousands of holy people and pilgrims who have walked these flagstones. 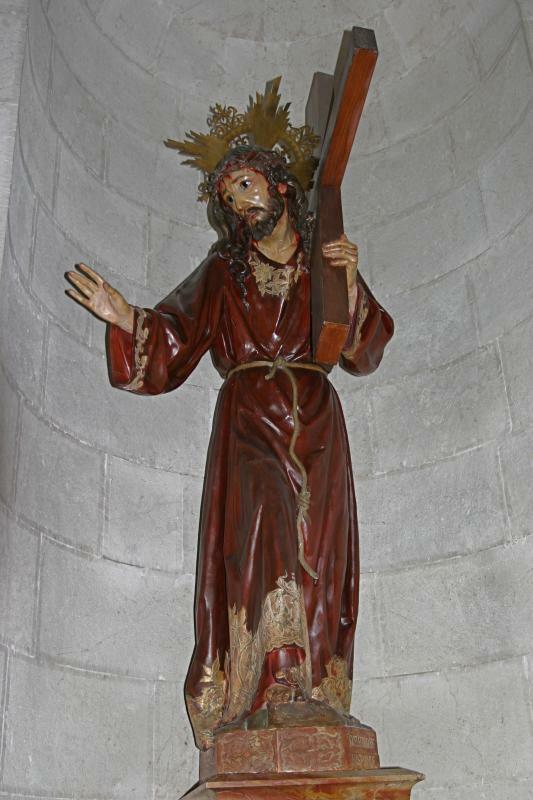 Shortly before 4.30am a Franciscan invites us to the first Catholic Mass of the day — inside the edicule, in Italian. 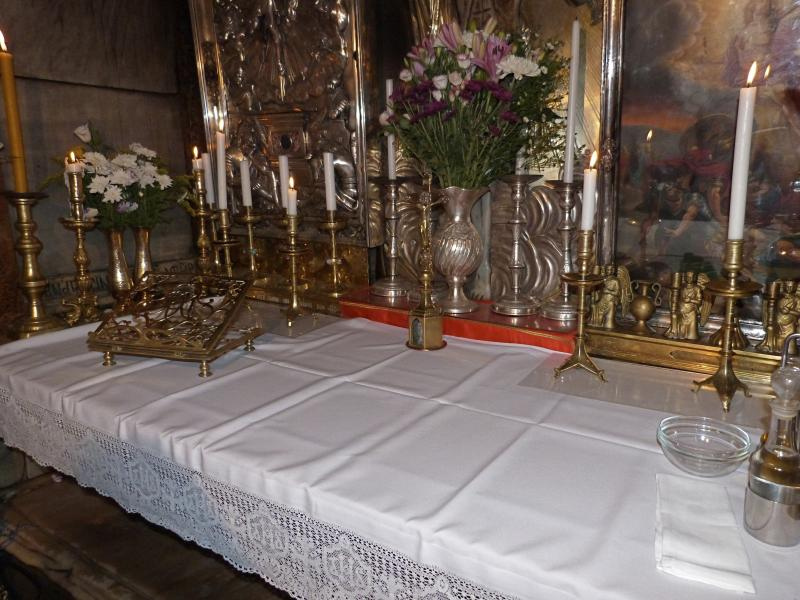 The priest has set up an altar over the Tomb slab. Two nuns bend low to join him in that confined space. 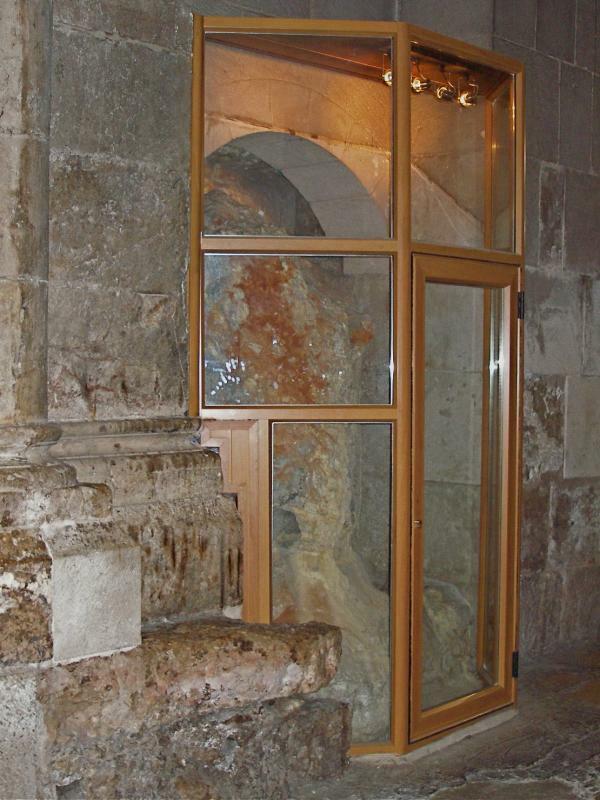 The other nine of us, one a young man wearing a Jewish prayer shawl around his shoulders, cluster elbow to elbow in the Chapel of the Angel, around a central pedestal containing what is believed to be a piece of the rolling stone used to close the Tomb. At Communion time the priest tucks the chalice into the crook of his left elbow, holds the ciborium in his left hand, and gives the Eucharist by intinction on the tongue. The simpleness of the ritual in no way detracts from the immense reality: The Body and Blood of Christ in the very place where his body lay. As we leave the church, the sequence of worship is continuing. 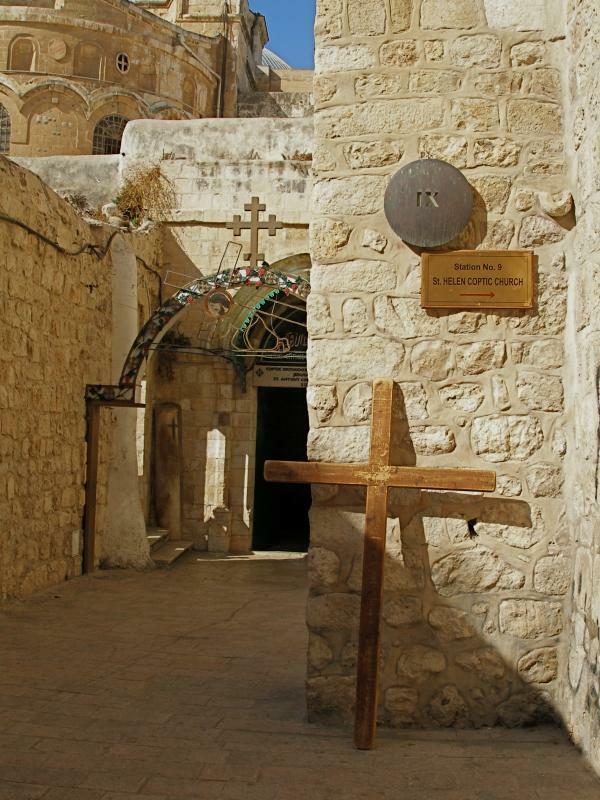 A sing-song chant is rising from the Coptic Orthodox at their tiny altar attached to the rear of the edicule. 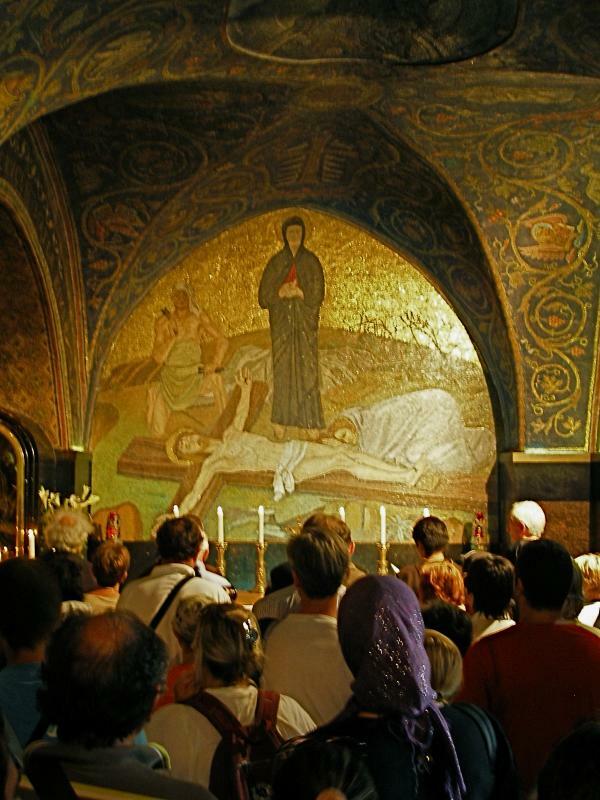 Upstairs, Franciscan friars are concelebrating in the Chapel of Calvary. 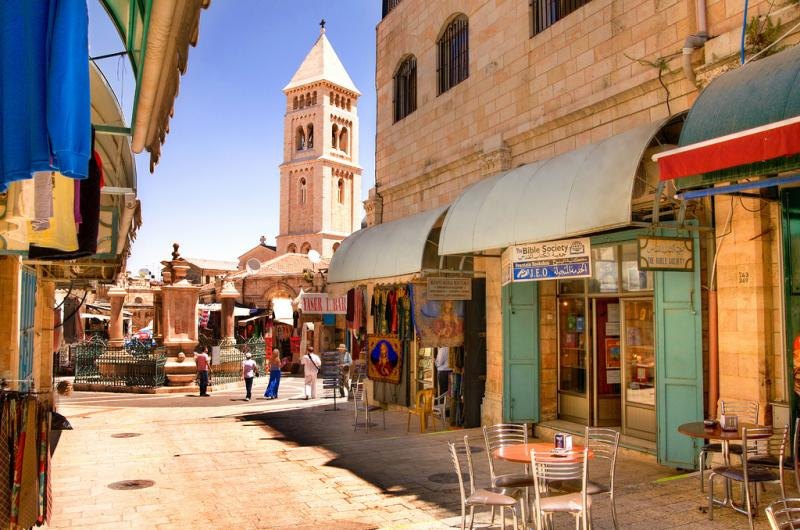 We walk down deserted streets of shuttered shops in the Old City. A lone star stands out in the predawn sky. A rooster crows. We buy warm cinnamon croissants from a man pushing a barrow. Our vigil is over, but the sounds and smells and images remain vivid in our minds. And we are still not sleepy.